Pigeon Forge is a town of many superlatives: It is home of the Great Smoky Mountains National Park (the most visited national park in the American Park System) and Dollywood (home of the Lightning Rod, the world’s fastest wooden roller coaster). It is also the home of BancAlliance member Tennessee State Bank, one of the first banks in Tennessee to join the consumer loan program. Today we are bringing you the behind-the-scenes story of their well-executed plan to transform their approach to offering personal loans. The delightful team at Tennessee State Bank spoke to the newsletter’s editorial staff about their rationale for participation in the joint marketing program offered by BancAlliance and Lending Club. 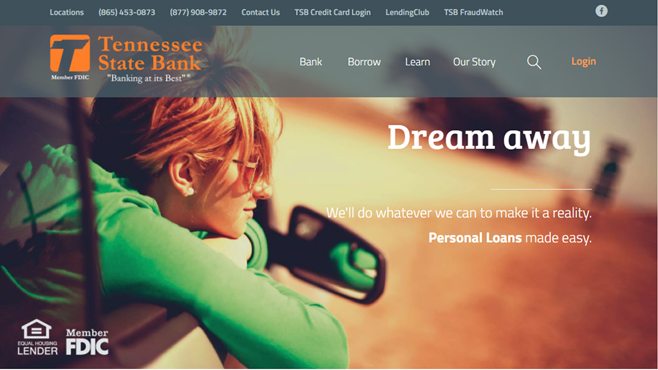 Tennessee State Bank had reached the conclusion that their customers – particularly those falling under the tech savvy millennial moniker – now expected an easy and fast way to acquire personal loans. At the same time, Tennessee State Bank recognized that unsecured consumer lending had not historically been a priority for the bank, but still felt it was important to present an online avenue for these loans. Since they suspected (and in some cases knew) that their customers were already accepting unsecured personal loans, they wanted to be part of that equation. The bank thought a partnership with BancAlliance and Lending Club would be the easiest way to implement a solution, and formed a project team tasked with executing the project throughout the entire organization. The mandate of the team was to identify and address the logistical issues associated with rolling out this plan, and present a solution to the bank that was simple and easy to execute on a day-to-day basis. Prior to launch, the team took a number of steps to ensure that all stakeholders were prepared. They set up mandatory bank training to make sure that branch employees felt prepared to respond to incoming questions from customers, and sent out a press release to all local newspapers in order to help educate the community about the forthcoming pre-approval offers they might start receiving from Tennessee State Bank and Lending Club. Once ready to launch the new offering within the community, Tennessee State Bank prioritized the promotion of their new product. They have prominently featured the program on the front page of their website since launching the program six months ago, highlighting the bank’s online capabilities. They put marketing banners up in the branches, displayed signage at teller windows, emailed their customers, ran radio ads, and included advertisements on the TVs in their lobbies. They also set up iPads in their branches with direct links to the Tennessee State Bank/Lending Club landing page, allowing customers to check interest rates for consumer loans. The iPads are located in clearly defined Customer Solution Centers, and have proved popular to date with both customers and branch employees. 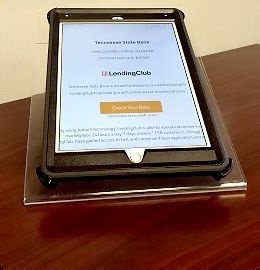 The iPads have also ensured all customers, including those without personal connectivity to the internet at home, have access to Tennessee State Bank/Lending Club’s online application portal. This brings us to assessing the response to date – which has been positive from both customers and bank employees. Response rates in the joint marketing program have been almost double compared to other similar sized banks in the program. The Tennessee State Bank team repeatedly noted that bank employees in particular have been very excited about the new product that they can offer their customers. Their colleagues have embraced the ability to run a quick demonstration via the branch iPad, and lead customers through a quick interest-rate check for an unsecured personal loan.